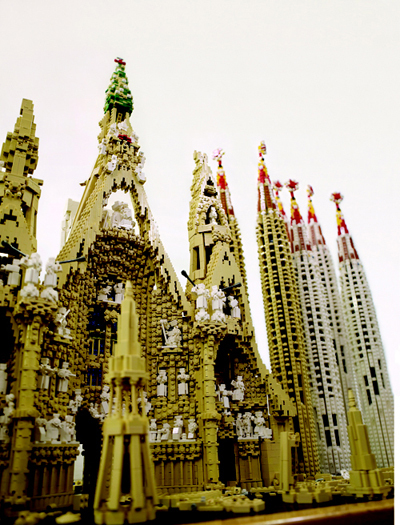 The cebterpiece of the exhibition is the model of Sagrada Familia church of Spain, a structure, of which construction commenced in 1882 and is still incomplete to this day. When Danish carpenter Ole Kirk Christiansen began to make wooden toys in 1932 in his workshop in Billund, Denmark, and named his fledging company ‘Lego,’ he likely could not imagine that by 2015 Lego would replace ‘Ferrari’ as the most powerful brand in the world. In 1947, Lego that is an abbreviation of Danish ‘leg godt’ meaning ‘play well’ began producing toys made of plastic, and introduced the interlocking bricks that are now synonymous with the company name two years later. Over the years, Lego’s bricks have been used to build all sorts of models, and not only by children. In 2003, a group of artists put together an exhibition of ‘World Heritage Sites in 27 Countries’ that was made entirely using Lego bricks. The exhibition opened in Shibuya, Tokyo, and was held for the second time in 2008. Both exhibitions were popular and attracted large crowds from throughout the country. 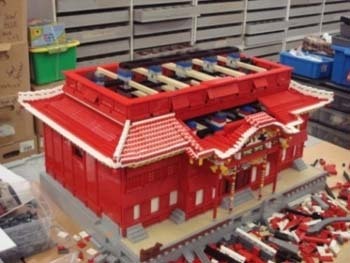 Shuri Castle built of Lego pieces. The third exhibition started in 2012 to commemorate the anniversary of the adoption of the ‘Convention Concerning the Protection of the World Cultural and Natural Heritage.’ The exhibition has since toured various cities in Japan and abroad, and attracted over 2,800,000 visitors in total. It now comes to Urasoe Art Museum. One of the supporters of the exhibition is UNESCO, and a part of the revenue from the exhibitions is donated to activities related to the world heritage sites. The exhibition opened in Urasoe Art Museum on Feb. 20th and runs through Apr. 10th. The museum is open every day except Mondays from 9:30-17:00. It’s open until 19:00 on Fridays. The last admission is 30 minutes before closing. Tickets to the exhibition cost ¥650 in advance or ¥800 at door for visitors high school age and older; ¥500 in advance and ¥600 at door for children age 4 to junior high school. 3-year-old and younger children are free. Advance tickets are sold at FamilyMart e-plus / Lawson (L code; 85400) / Co-op Apre / Urasoe Art Museum /Ryubo Department Store.